Obama should have read this before he started negotiating with the Taliban. Since no country is immune to terrorism, it is imperative that governments have the appropriate policies, intelligence and flexible response options to deal effectively with terrorist acts. Trained personnel and programs must be in place before, during and after each crisis, both to respond to the problem and to answer inevitable criticism in the event of failure. Long-term policies to achieve these objectives are costly, complicated and difficult, yet essential as a defense against the importation of terrorism from overseas. 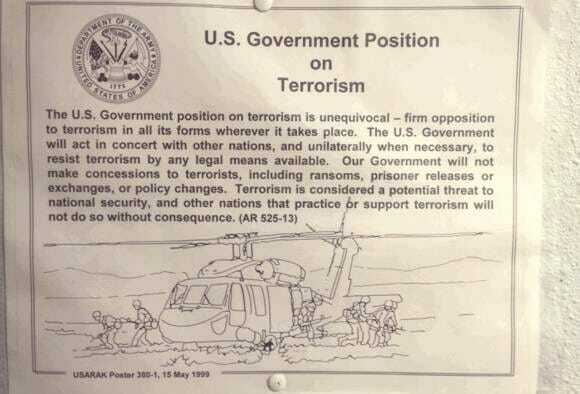 • The U.S. Government is opposed to domestic and international terrorism and is prepared to act in concert with other nations or unilaterally when necessary to prevent or respond to terrorist acts. • The U.S. Government considers the practice of terrorism by any person or group a potential threat to its national security and will resist the use of terrorism by all legal means available. • States that practice terrorism or actively support it will not do so without consequence. If there is evidence that a state is mounting or intends to conduct an act of terrorism against this country, the United States will take measures to protect its citizens, property and interests. • The U.S. Government will make no concessions to terrorists. It will not pay ransoms, release prisoners, change its policies or agree to other acts that might encourage additional terrorism. At the same time, the United States will use every available resource to gain the safe return of American citizens who are held hostage by terrorists. • The United States will act in a strong manner against terrorists without surrendering basic freedoms or endangering democratic principles, and encourages other governments to take similar stands.